"A 110V fan provides enough airflow to keep the puck in play and there are no reports of fan failure with this model." "An excellent choice for serious air hockey, and it’s commonly described as being arcade-quality and tournament-worthy." "If you have just 48" of room (plus a little extra to stand at either end of the table), you have space for this fun, compact air hockey table." "Solid and heavy enough for serious competitive play, the Viper Vancouver is a full-size air hockey table that outputs 110 cubic feet of air per minute." "Offering a 40-inch play surface and weighing only 14 pounds, this tabletop air hockey table is quick to set up." "Popular with savvy spenders and is a great choice for kids and adults alike." "Has a 4’ playing surface and parents find that its smaller size makes it easy for even younger children to reach the tabletop." "The gray-washed oak veneer finish, trestle-style legs, and cast metal frame...allow this table to blend into any type of living space." For an air hockey table that is big on fun and offers an excellent value, the Playcraft Derby 6’ Air Hockey Table is our top choice. While this is not a professional-level air hockey table, it is a great choice for anyone who wants to enjoy some fast-paced table hockey at home. With a PVC-laminated surface that stretches out a full six feet, you’ll have plenty of surface area to perfect your technique and try out new tricks against your opponent. A 110V fan provides enough airflow to keep the puck in play and there are no reports of fan failure with this model. This table does skimp a little in the quality of accessories, including the automatic scoring module which some people feel should be hardwired into the table rather than operating on battery power. But in general, this Playcraft Derby Air Hockey Table is known for being surprisingly sturdy and solid-feeling, despite the fact that it’s less than half the price of many other 6-7’ air hockey tables. It also looks quite nice in a living room, den, or basement with either a black or cherry laminate finish. If you’re a recreational air hockey player looking for a full-size table for hours of enjoyment, choose the Playcraft Derby 6’ Air Hockey Table. For one of the best air hockey tables you can buy, check out this elite version designed by professional air hockey players for serious enthusiasts of the game. The Home Pro Elite Air Hockey Table by Gold Standard Games is a popular pick for game rooms that demand the very best. This solid table measures a full 7-feet long and provides a smooth surface for competitive game play, complete with professional-style aluminum rails for rebound and fast action. 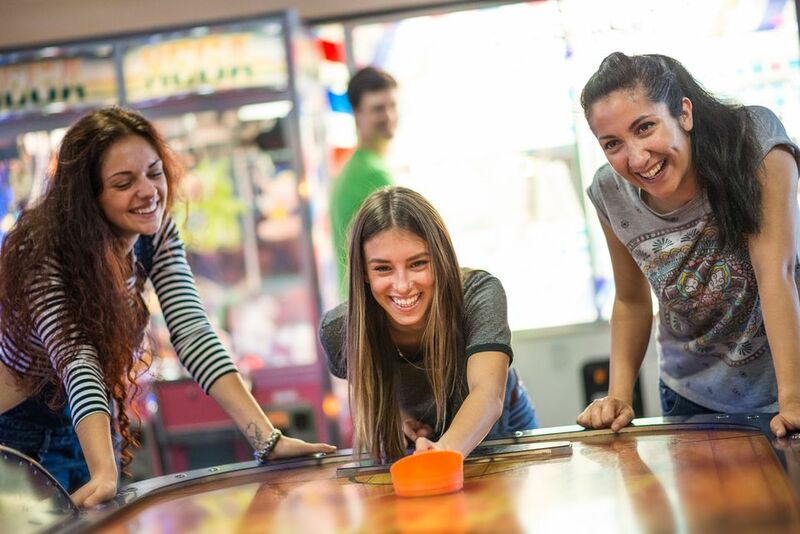 People agree that it is an excellent choice for serious air hockey, and it’s commonly described as being arcade-quality and tournament-worthy. A few people were surprised by the noise level of the fan, but others are quick to point out that this is to be expected with such a powerful, quality table. It isn’t disruptive but may not be quiet enough to use in a room where someone else is watching television. Be prepared to recruit help for unloading and assembling this full-size air hockey table. It’s not light, and most people recommend the help of at least one or two other people to properly set it up. But in return for their assistance, they’ll get the chance to play on one of the nicest in-home air hockey tables on the market. If you’re short on space but looking for big fun, you’ll find it with the Harvil 4’ Air Hockey Game Table. This compact air hockey table is suitable for both children and adults. At only 48” long, it’s easy to tuck this air hockey table into a corner or smaller bedroom doubling as an entertainment space. It also is a good compromise if the kids want an air hockey table and the parents don’t want to give up living room real estate or storage room in the basement or garage. While this air hockey table for small spaces performs big in many areas, its weak spot is the electronic scorer. Some people find that it doesn’t always register the score accurately. Many players wind up using a manual scorer instead, but still find this air hockey table to be well worth its roughly $100 price tag and small footprint. If you have just 48" of room (plus a little extra to stand at either end of the table), you have space for this fun, compact air hockey table from Harvil. If you have a large game room, take advantage of the extra space by purchasing a large air hockey table like this 7.5’ version from Viper Vancouver. Described as being solid and heavy enough for serious competitive play, the Viper Vancouver is a full-size air hockey table that outputs 110 cubic feet of air per minute. This generous cushion of air will allow the puck to glide across the table at high speeds and is a considerable improvement in feel and function over entry-level air hockey tables. People like that the electronic scorer offers multiple game modes, including both timed and untimed options. This extra large air hockey table has been used by players of all ages and will make a great addition to your game room. Just know that such a large air hockey table will need at least two people to move and assemble it. If you have space or a serious passion for air hockey, a full-size table like the Viper Vancouver 7.5’ Air Hockey Table is an excellent choice. If you don’t have the floor space for an air hockey table or you just don’t want one permanently set up in your home, a tabletop version of air hockey is the perfect solution. Enjoy all the fun of this classic game in a smaller version with the Sport Squad HX40 Electric Tabletop Air Hockey Table. Offering a 40-inch play surface and weighing only 14 pounds, this tabletop air hockey table is quick to set up – just set it on your dining table, coffee table, or any other flat surface and plug it in. When you’re done, it’s easy to slide this portable air hockey table under a bed or tuck it into a closet. The easy storage of this game also makes it a great choice as an air hockey table for college. While you may not have room in your dorm for a full-size table, this smaller version is still big enough to challenge your college comrades. This tabletop air hockey game works great for kids, but it could be small for very competitive adults whose longer arms could reach across the middle of the board. If everyone agrees to play by the rules, then this air hockey table can be big fun for everyone. One common complaint is that the felt comes off the pucks, but this is an easy fix for most people. The Sport Squad HX40 is the perfect air hockey table to buy if you want the fun of occasional game play, but don’t want to commit to the space requirements of a full-size table. If you can settle for a smaller playing surface, you can pick up an affordable air hockey table for about $50. The EA Sports 60” Air-Powered Hockey Table is popular with savvy spenders and is a great choice for kids and adults alike. As mentioned, this air hockey table is smaller than full-size models and the playing surface is only 5 feet long. However, many users happily report that this air hockey table has been used by both children and adults for hours of air hockey battles. You may find that the airflow isn’t as strong as professional-grade tables, but it’s adequate for basic recreational use. It’s easy to assemble and light enough that it can usually be accomplished by one or two people. In fact, a lot of people comment on how sturdy the table feels and how it seems to hold up well even during intense gameplay. 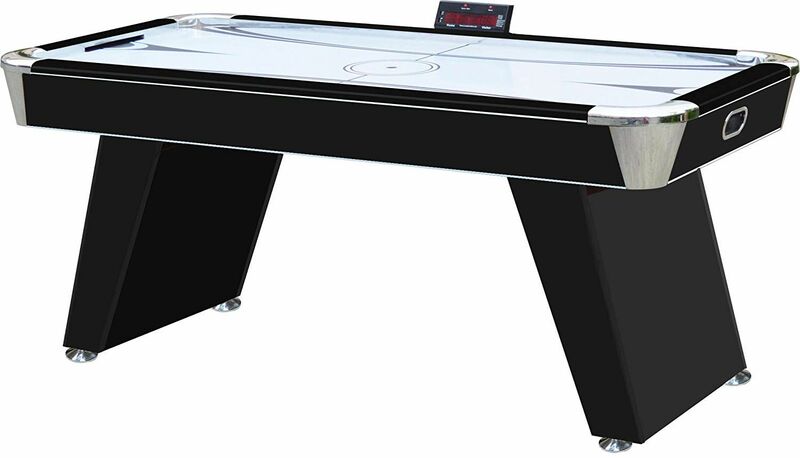 If you choose this budget air hockey table, you should know that the electronic LED scoring system isn’t always accurate – which is common for many lower-priced models. This doesn’t stop most people from having a great time using this air hockey table, and its overall operation is hard to beat for the bottom budget price. Give your kids or grandkids an air hockey table that is sized just right for them – and is a perfect fit for playrooms, bedrooms, or other small spaces. The Hathaway Hat Trick 4’ Air Hockey Table is a popular choice for kids and has an affordable price tag to match. This air hockey table for kids has a 4’ playing surface and parents find that its smaller size makes it easy for even younger children to reach the tabletop. As an added bonus, users point out that it’s easy to assemble and lightweight. With simple graphics and an electronic scoring system, your kids will be drawn to this air hockey table designed with them in mind. But don’t think it’s too small to host an air hockey tournament with the kids taking on the adults! Plenty of parents report using this table along with their children. While it isn’t the sturdiest or most robust air hockey table on the market, people agree that it’s a good value for the money and makes a great starter air hockey table for kids. If you want to skip the arcade look and add a touch of class to your game room, opt for a stylish yet functional air hockey table like this model from Pottery Barn. This nearly 7’ long air hockey table was crafted in partnership with American Heritage Billiards, which is one of the largest game room furniture manufacturers. The company focuses on making heirloom quality pieces and the result is an air hockey table that marries functionality and style. You’ll appreciate the gray-washed oak veneer finish, trestle-style legs, and cast metal frame that allow this table to blend into any type of living space. The playing surface conforms to regulation standards and has adjustable levelers for added stability. While there is no automatic scorer, the manual scoring abacuses on either end of the table will help you keep track of points. This Pottery Barn Air Hockey Table is a great choice for anyone that wants to have the classic fun of air hockey in a stylish, furniture-quality piece. Our writers spent 4 hours researching the most popular air hockey tables on the market. Before making their final recommendations, they considered 20 different tables overall, screened options from 13 different brands and manufacturers and read over 140 user reviews (both positive and negative). All of this research adds up to recommendations you can trust.